Before we even touched down in Goa, India we knew we were in for a crazy adventure. Before we landed, the air hostess asked us to cover our faces whilst they disinfected the plane with what smelt like toxic fumes! Unfortunately my backpack didn’t make it, so I had to get used to the feel of boxer shorts (thanks Phil :)) We caught a taxi outside the airport, not a difficult task as they were literally fighting over us! We were to leave them disappointed though as we were only going to a hotel near the airport a few kilometres away in Vasco de Gama. Settling into M the Business hotel, we were pleasantly surprised how nice it was 🙂 We would later come to really that it was like the Ritz in India haha! The next morning, we arose, got ready and headed down for breakfast which was an usual but tasty affair 🙂 We had a concoction of south Indian and a fry, including kari Puttu and eggs with toast! The coffee was a bit odd though with a skin on top of it, we would learn that India doesn’t do great coffee but they do have wonderful tea (of course!). The next flight from Kuala Lumpur wasn’t for three days and as exciting as Vasco looked we decided to take the bus up to North Goa 🙂 The local buses are an adventure in themselves but we were pleasantly surprised how helpful the locals were with getting us the right buses, as you can guess going from one place to another in India often involves several stops and swaps! However, you do get to listen to Bollywood music enroute, so that was cool 🙂 We also had our first experience with the Indian head wag which can mean several different things and to us westerners got a bit confusing at times lol! discovered that seating on the buses wasn’t a straight forward affair, the locals looked each other up and down and then decided it they would sit down beside them if they were of the right caste etc, women also had their own section and you could receive a dirty look for sitting down beside a man even if that was the only seat left! We got off our bus in Panjim and wandered around the town where we happened on our first coffee day, India’s equivalent to Starbucks and we got some yummy coffee and samosas 🙂 We walked through the pretty Latin quarter (evidence of the Portuguese influence is abundant here). We had our first taste of Indian markets and what a treat it was, the chaos, the shouting, the colours of the local women in pretty sari’s selling their produce. It was a fish market and I don’t think my stomach would be up to the task of eating it but it was great to see it 🙂 We went into a phone shop to purchase a sim card and learned it would be an easy task, we needed as much documentation as for our visas, we also needed a reference off a local Indian person so we left it and prayed that we would get by on wi-fi and old-fashioned guidebooks! Our next bus up to Vagator was packed to the rafters and many of the buses (including this one) didn’t have space for luggage so we sat with our luggage on our laps (one tine I was grateful to Air Asia for misplacing my backpack lol) and felt lucky to have a seat 🙂 The road was very bumby with many obstacles including the sacred cows who know they have the right of way. What a journey, with only an open window as AC and swerving around bulls, never experienced anything quite like it but I have to say it was fun! The best bit was when we pulled up a stop and guy came along wheeling a wheelbarrow full to the neck of ice-creams sitting in ice which he passed to buyers through the window of the bus for very small money! We reached Vagator and searched for some accommodation for the three days, many of the places were full but we found somewhere in good time with space for us and wifi (well that was to be debated as it only worked half the time!) but the owner was a lovely lady so that made up for it. We dropped off our stuff, took cold showers after the sticky hot bus experience and headed off to Vagator beach. 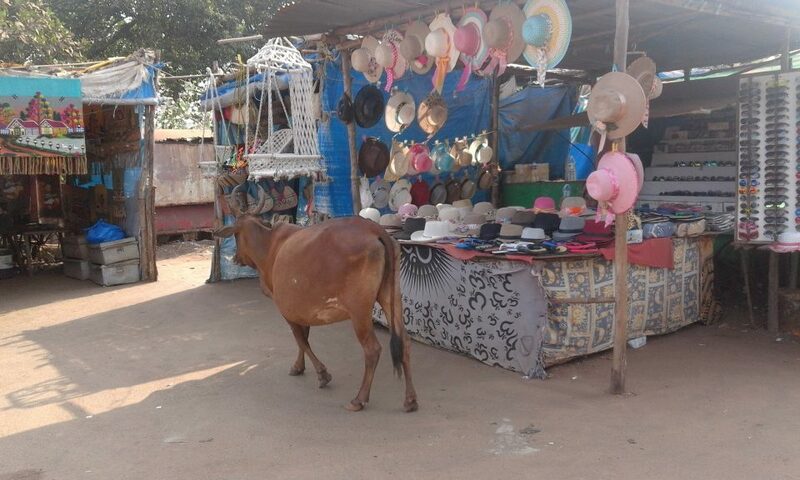 Well Vagator beach was a real treat and the most awesome part were the sacred cows joining you for a beach stroll or a spot of sunbathing 🙂 Next on the agenda was to purchase some replacement clothes for myself, this was not to be an easy task and I really missed primark in this moment!